Last week a friend asked me what recipes I like to make with oat bran. I've used it in muffins and breads, but her question inspired me to come up with something that was super simple, nutritious and perfect for both babies AND adults (not always an easy thing to accomplish). This creamy hot oat bran cereal is so yummy, its even got me to switch over from my usual morning bowl of oatmeal to this hearty dish. Oat bran is the outer husk of the oat grain which contains the bulk of its dietary fiber. When mixed with water and milk it becomes creamy like a porridge. 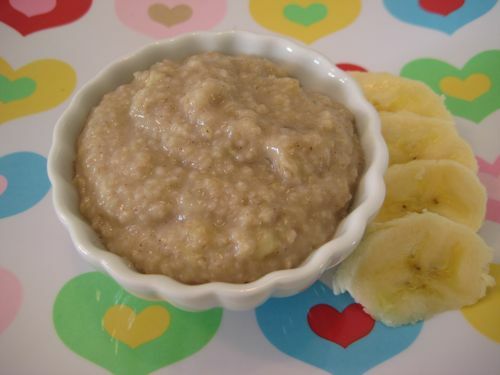 I especially love adding bananas to this recipe because they're packed with vitamins B6 and C and potassium, and bananas' natural sweetness is beneficial because you don't need to add tons of sugar for sweetness. They also give the oat bran extra body. This is a great recipe to try when you feel like switching up your morning food routine or just need a good bowl of comfort food. 1. Bring the water and or milk to a boil. 2. Pour in the oat bran, reduce the heat to low and cook for 5 minutes. 3. Add the honey or maple syrup, mashed banana and the cinnamon. Stir to combine. Seitan Tacos - Vegans and Carnivores Unite! I am happy to say that I will never be eating instant oatmeal again! Mmm! Yum! This is soooo good and great for the cool fall mornings we've been having. Thanks for another great recipe! I have wheat bran on hand, could I substitute wheat bran for the oat bran? Do you have to use banana and honey/maple syrup? Can you just have it plain, whether it has very much flavor or not? I just need it to taste ok, it doesn't have to be delicious. You could absolutely leave it plain if you prefer! I personally prefer oat bran cereal with lots of flavor which is why I add things to it!